Our first angel weathervane design, this Angel in Repose Weather Vane is still one of our favorites. You may notice a similarity between this angel and our Angel on the Moon Weathervane. One of our customers asked if we could put the angel from this weather vane design onto a moon. We thought it was a great idea and all of us were very pleased with the result. However, this simpler version is also appealing in its own right and remains a popular choice. 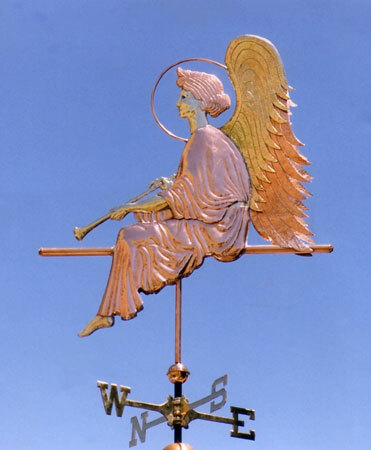 The process of taking this Angel in Repose Weather Vane and transferring her to the moon setting is an example of personalizing a weather vane design as opposed to commissioning a new design. Because much of the design work had already been done and we were simply combining two different sets of design elements, this was a less expensive alternative to commissioning an entirely new weathervane. Please let us know if you have a thought on personalizing one of our weathervanes and we would be happy to work with you to see how it could be done. We made the Angel in Repose Weathervane shown here with optional gold leafing on her face, hands, feet, halo, trumpet and the upper wing panel. Over time, the copper will weather a deep chocolate brown before eventually turning turquoise green. The optional gold leaf retains its luminosity throughout its life. Eventually, the gold will begin to wear off, but typically by that time, the copper has weathered a beautiful green and the juxtaposition of colors is quite lovely. In fact, in the world of antique copper weathervanes, the vanes that usually command the highest prices are those with traces of the original gold in combination with the turquoise green of the weathered copper.